The 55POS9002 isn't your usual Philips TV. Its combination of an OLED screen and a new streamlined, ultra powerful processing engine seems to have uncovered a new side of Philips' picture quality personality - one that seems as interested in accuracy and subtlety as it used to be focused on drama and grand-standing. After scoring a critical hit with its debut OLED TV, the 901F, it's hardly a surprise to find Philips wasting little time returning to the OLED fray with the 9002. What's more, this 55-inch set improves on its predecessor in most ways, while costing less, and manages to find enough points of difference - namely in its Ambilight beyond-the-screen projection - to make it much more than just a copycat of LG's rival OLED B7. The 9002 stands out from the crowd right from the off with its truly striking design. Particularly eye-catching is Philips' unique Ambilight technology, which sees coloured lights capable of matching the on-screen content and casting it from three of the TV's four edges onto the surrounding walls. Its finish is also strikingly metallic for such an affordable (by OLED standards) TV, and its ultra-skinny frame and rear are both classic space-saving signs that you've treated yourself to an OLED rather than LCD television. Tucked away on its rear is a set of connections that again give no hint that this is one of the OLED TV world's most affordable options. As well as boasting four HDMIs, for instance, all four of those HDMIs prove capable of handling 4K HDR (high dynamic range) signals. Its three USBs support both multimedia playback and recording from the integrated Freeview HD tuner, while the now de rigueur Wi-Fi and Ethernet network connections can stream multimedia from networked DLNA devices or take you online with Philips' smart TV platform. The 9002's remote control warrants a mention here too, for the way it carries a full QWERTY keyboard on its rear. This may strike some as a bit old-fashioned in these days of advanced voice control systems, but it's still far preferable to the sort of soft onscreen keyboards so many TVs force you to use when inputting text into search engines or password fields. The 55POS9002 is the first Philips TV to use the brand's latest P5 picture processing engine. This takes its name from the way it works on the five main components of picture quality: sharpness, motion, colour, contrast and source optimisation. It's claimed to be around 25 per cent more powerful than any of Philips' previous TV processors - which is saying something, given that Philips has a reputation for pushing the envelope where video processing is concerned. It's not just more power that makes the P5 so promising either. Philips claims it also uses its power more efficiently - and in a more logical path - thanks to the way it consolidates what was once spread across three chips onto a single new chip. There's no 3D support on the 9002, in keeping with 99 per cent of all TVs this year. There is, however, support for both the industry standard HDR10 and broadcast-friendly HLG HDR formats. There's definitely no support for the advanced Dolby Vision system, though, nor does it seem there will be any firmware-added support for the recently announced HDR10+ system, with its extra layer of dynamic metadata to help TVs show HDR better.If you're not typically a fan of heavy picture processing then fear not: Philips has, as always, given you the option to turn pretty much everything off if you prefer. The idea that all picture processing is evil by default is starting to look pretty outmoded these days. The Ultra HD OLED screen that's central to the 9002 is a key part of its picture appeal, of course. Unlike LCD TVs, which have to use external light sources to illuminate many pixels at once, each pixel in an OLED screen can make its own light. This results in black colours able to sit right alongside the brightest whites - even in HDR pictures without the bright parts having to have their brightness compromised, or dark parts being left looking grey. The 9002's OLED screen produces a measured peak brightness on a 10 per cent white HDR window of around 740 nits. This is less than half the peak brightness delivered by Samsung's Q9F LCD TV, and will inevitably limit how intense the brightest end of its HDR performance can look. Experience shows, though, that OLED's ability to put its darkest blacks - blacks deeper than you'll get from any LCD TV - just a pixel away from its brightest whites delivers a different kind of HDR experience that many AV fans adore. Android TV has been around for a couple of years now, but it's still struggling to find its feet as a truly effective smart TV system. That it's an open-source system means there are loads of apps available for it, which is its one potential strength. However, the majority of those apps are pretty lame game or infotainment efforts that are far from essential on a TV, while a few more essential goodies - such as support for all of the UK's main terrestrial broadcaster catch-up TV services, and Now TV - are conspicuous by their absence. At least Philips has seen to it that you get the 4K and HDR-capable apps for Amazon and Netflix. Unfortunately, though, Android TV also features a clunky interface that takes over the entire screen, leaves precious little room for customisation, and seems to have little understanding of the sort of content TV users are likely to be most interested in. At least it runs less buggily on the Philips 9002 than it does on Sony's Android TVs. Strange though this might sound, the 9002 proves how good Philips' new P5 processing engine is by making you almost forget it's there. In other words, while it helps the set deliver mostly outstanding pictures by subtly improving every part of picture quality across any source you throw at it, it does so without pushing things so far they start to look too extreme, or generating excessive unwanted processing side effects. Provided, anyway, that you steer clear of the most aggressive settings for some of the set's processing options. Take, for instance, the 9002's handling of dark scenes. While it doesn't deliver as profound and rich black colours as rival OLED TVs, it compensates for this superbly by reproducing exceptional amounts of shadow detailing in even the darkest parts of the picture, and by providing superior control over its OLED pixels at just-above-black levels. This means you don't get any of the noise in dark areas you still get with LG's OLED TVs. Nor is there any instability (sudden infusions of greyness) in the 9002's dark scenes, like the sort you can get with LG's OLED TVs. This really is very impressive for such an affordable OLED set. The 9002's sharpness with native 4K sources impresses too. Its excellent light management capabilities help it bring out every tiny nuance, texture and detail of good quality native 4K images, while its pretty remarkable motion processing is capable of reducing pretty much all traces of judder and blur to ensure that you don't lose any of the 4K effect when there's motion in the frame. Philips has a long reputation for processing away judder - but previously only at the cost of some often quite distracting shimmering, haloing noise around the edges of moving objects. With the advent of the P5 engine, the impact of unwanted side effects is greatly reduced. In fact, provided you don't set the motion processing higher than its lowest power setting, it delivers some of the most natural looking motion around. Philips' new processing prowess comes into its own, too, when it comes to handling the brightest parts of HDR pictures. Its remapping of HDR content's extreme brightness to its peak 740 nits of light output is clever enough to retain plenty of subtle tones and details in areas such as direct sunlight, bright clouds, and intense metallic reflections. There's precious little of the distracting bleached-out look to the brightest HDR areas you get with many LCD and OLED TVs that fall short of the brightness levels used by HDR content. This strong detailing in bright areas of the 55POS9002 joins with a clear leap in real peak brightness to deliver arguably the most instant improvement over Philips' 901F OLED debut TV. Though there are actually plenty of other steps forward, too. Philips TVs have tended to take a pretty (some would say over) aggressive approach to colour over the years. With the 9002, however, while the setting options are there to go extreme with colours if you want to, the P5 engine can also provide really superb levels of colour tone subtlety and finesse. Add this deft and accurate approach to colour to the 9002's detail and light management prowess, and you've got a picture that serious AV fans and more casual TV users can both love. The P5 processor rounds out a truly impressive debut with some brilliant upscaling of HD sources to the TV's 4K native resolution. While upscaled pictures perhaps don't look quite as crisp and sharp as those of some of Philips' previous 4K TVs, the results certainly look more natural. There's less noise and grittiness, and the upscaling does a better job of intelligently calculating the likely colour tones and light levels for each of the millions of extra pixels it's creating. One last strength of the 9002's pictures is their viewing angle. In keeping with all OLED TVs, this Philips set can be watched from almost any angle without any reduction in the image's contrast or colour saturation. This stands in stark contrast to the viewing angle situation with all LCD TVs - especially models that use so-called VA panel technology rather than IPS technology. The 9002 is not perfect, though. Its pictures aren't quite as bright, dynamic and punchy as those of LG's OLED TVs. Getting the absolute best balance from its various picture processing systems can take quite a bit of work too. For its money, however, the 55POS9002's pictures can be considered outstanding. What's more, the influence of the P5 processor allows Philips to deliver enough difference between the 9002 and LG's similarly priced OLED B7 (without necessarily being clearly better) to make it a genuinely tempting alternative. Plus, there's the fun of Philips' Ambilight. This is the one performance area where the 9002 falls short of Philips' first OLED TV, the 901F. Its more subtly integrated speakers just can't match the bass, power, clarity and directness of the 901F's built-in soundbar. Comparing the 9002's audio with many of its current rivals, though, it actually holds up well. The mid range sounds open and smooth rather than thin and harsh, detailing is strong, and it can hit surprisingly robust volumes without succumbing to cabinet rattles or speaker phutting/drop outs. Bass sounds a little woolly and indistinct versus the rest of the audio elements, but at least there is some. The 55-inch POS9002 isn't your usual Philips TV. Its combination of an OLED screen and a new streamlined, ultra powerful processing engine seems to have uncovered a new side of Philips' picture quality personality - one that seems as interested in accuracy and subtlety as it used to be focused on drama and grand-standing. The result, if you take a little care with some of the TV's settings, is a remarkably consistent, natural and immersive performance that's both great value and different enough from that of LG's rival OLED B7 to make it a truly compelling alternative. And if Ambilight is something that also lures you in, then this could be your perfect OLED TV match. All of LG's 2017 OLED TVs deliver the same picture quality, regardless of price. 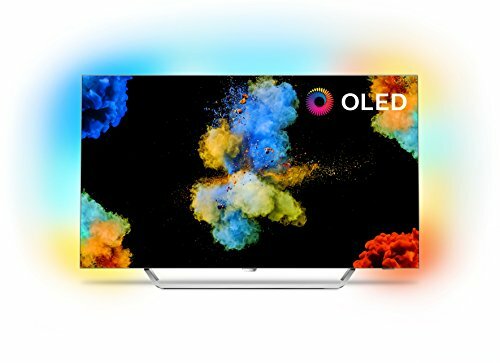 Which means even this £1,799 entry-level model delivers the sensational contrast, dynamism and colour richness that's become such a beloved LG OLED trademark. Its webOS operating system is a delight, too. There's no Ambilight, of course, so if that's a Philips lure then be prepared to pay a couple of hundred extra for the 9002. Sony's 55XE9305 offers probably the best LCD alternative to the 9002's OLED charms. Its biggest attraction is that it gives you twice as much HDR-friendly brightness as the Philips set, as well as another superb video processing system. There's a trade off for all that brightness, though, in shallower black levels and some occasionally distracting backlight clouding.